Uniting the forensic community around a searchable, centralized, timely, relevant Grant Management System (GMS). The Forensic Technology Center of Excellence (FTCoE) works to propel the forensic science community by managing the testing and evaluation of emerging technologies. Advancing technology, sharing knowledge and addressing challenges are all imperative aspects of the FTCoE mission. Through technical assessment, assistance and guidance resources, the FTCoE identifies and removes possible barriers to the adoption of innovative technology. Improving industry practices ensures that advantageous technological transformations are in the hands of forward-thinking practitioners, stakeholders and policymakers. The Forensic Technology Center of Excellence’s application for their grant process began as a Microsoft Access database. It was then ported to an SQL database with a web-enabled client interface, which uses an entity data model (EDM) framework to manage connections between the application and the database. At its core, the application’s basic functionality is to intake batches of grants along with grantee data. Users are able to edit, update statuses and contribute to progressing the grant through the proper approval channels. However, user functions were limited and the application needed heavy intervention from programmers and database administrators just to perform the most basic functions. Thus, the application that was meant to improve the FTCoE grant process, became a barrier in many ways. Not only was the user interface not intuitive, but it was also disconnected from data points. This overall disjointed experience produced a clumsy tool that ultimately, led to frustrated users. Though it had its drawbacks, the FTCoE saw the potential in the application and sought to find a way to improve user experience and increase functionality. Our process began with an in-depth discovery session to better understand the journey that users take while interacting with the application, and their goals in using the application. There was data that clearly needed to be captured, but there was also “hidden” data that needed to be brought to light in order to create a holistic product. We worked hand-in-hand with the Forensic Technology Center of Excellence’s stakeholders to flesh-out required application fields, discuss methodologies of intake and review other functional components such as data vetting and team member task assignments. By truly understanding the user journey and grant process, we were able to tailor a custom solution for the FTCoE’s need. 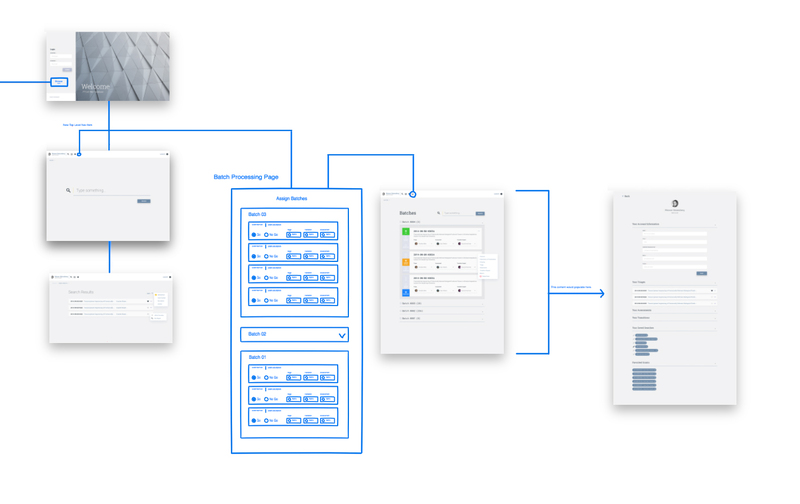 As we designed a solution for the FTCoE, there were specific features that we prioritized throughout the sketching, wireframing and prototyping process. These key features are ones that the FTCoE denoted as critical and they include: search, task assignment and reporting. Since these aspects make up the core of the application, we kept them at the forefront of our solution to ensure that the holistic experience flourished with these critical features. Search: The original application iteration lacked a search feature, which was inconvenient and restricted user functionality. We made sure to resolve this issue in our solution and placed the search feature front and center in our design efforts. We also added a supplemental “favorite” feature, where users are able to bookmark specific grants and add them to their favorites list for easier access. Task Assignment: As a grant travels through the appropriate channels, it passes through a few hands to ensure its validity. 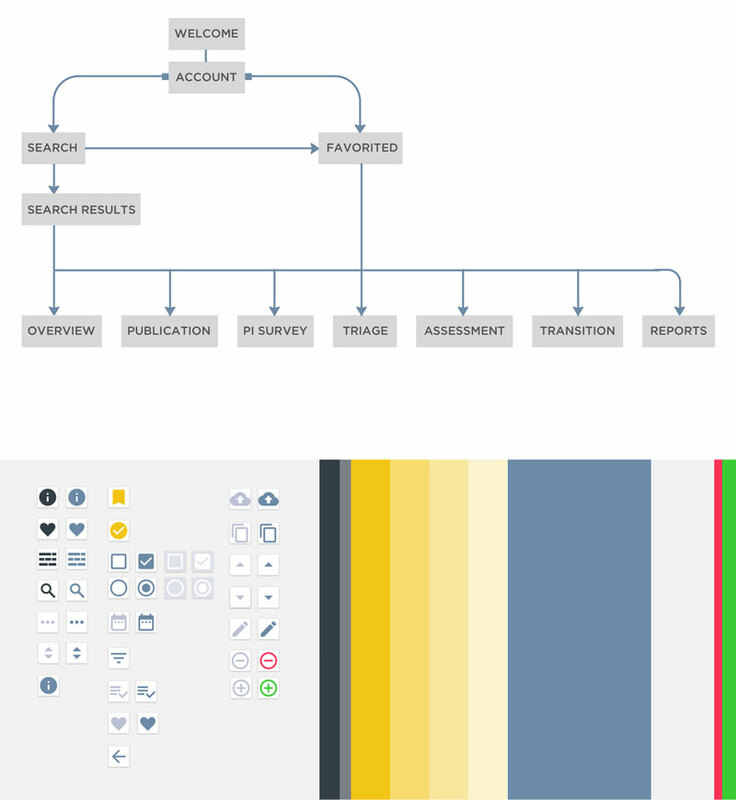 Knowing this, we created a method to assign users the ability to make triages, assessments and transitions to grants. We also gave administrators a way to manage and assign task responsibilities. Reporting: It was apparent that the ability to see all grants in the pipeline from a higher perspective was very important to the FTCoE early on in our discussions. We built a reporting system that allows the user to activate or deactivate sections for individual grants as well as bulk views of all grants. 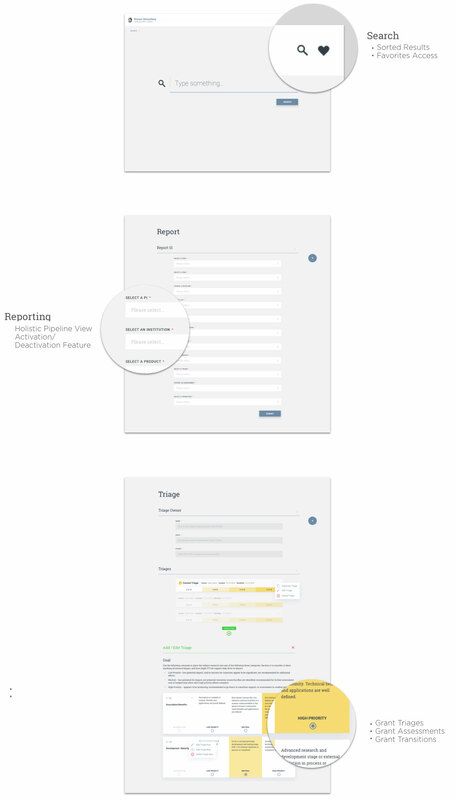 We wanted to provide a reporting system robust enough to view data from a granular level all the way to the entire grant batch. We gave the content (Word Docs) a wireframe structure to better enable us to find the “path” for administrators and users. 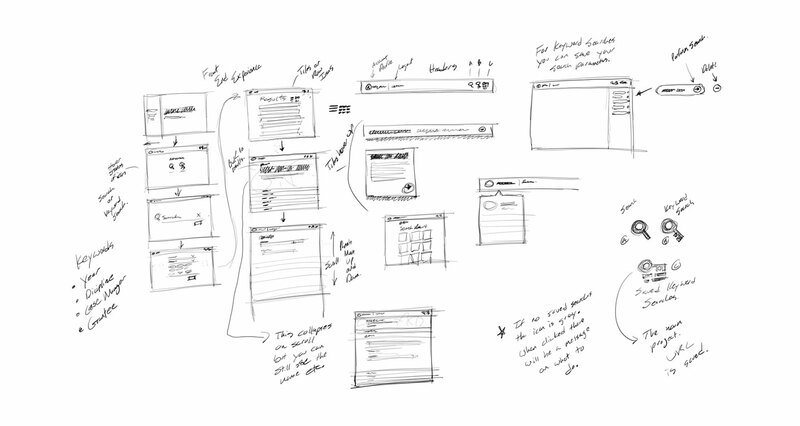 As we iterated the wireframes, the path became clear and we realized that there were gaps in how someone might retrieve a data point or assign tasks. 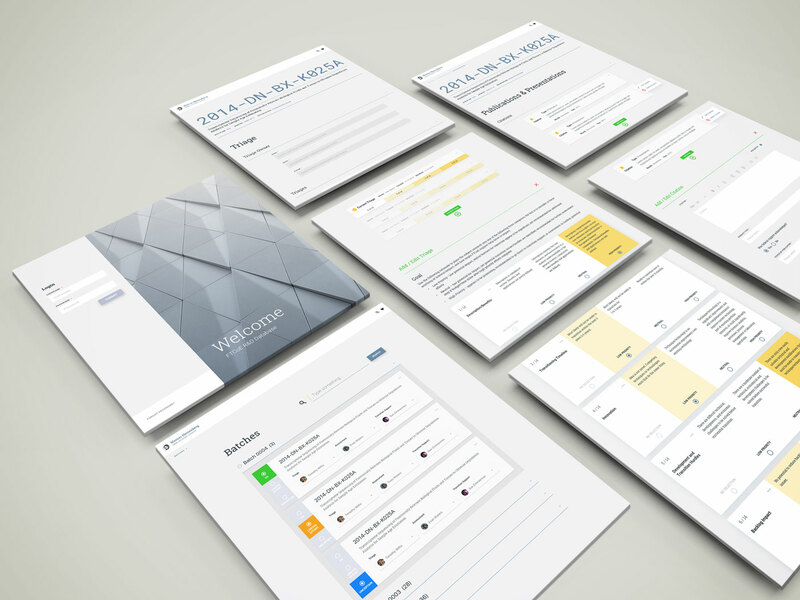 We took calculated steps to rectify the gaps by creating an entirely fleshed-out, clickable prototype and iterating on that prototype throughout user testing and documenting the feedback received. Our goal with the prototype was to provide a precise method to intake grants and assign users to those grants to make triages, assessments, transitions and determine a status for the grant as to whether it moves forward in the pipeline to get approved. We established a visual design language using the tried and true method of Atomic Design principals. This gave us the freedom and flexibility to create components and sections naturally. This framework not only provides consistent structure, but it also allows us to future build for any new elements or parts. Data doesn’t have to be boring. When appropriately presented, it should provide delight to the user. The amount of data on a single screen might be overwhelming for some, so we built collapsable sections to reduce clutter but still have the UI feel intuitive. The grant sub navigation allows you to move between grant screens and can be revealed or concealed with just a tap of a finger. All of the animations are subtle and were meant to ease the transition between fields and data points. We provided end-to-end clarity for the entire grant intake and procurement process, and produced an application that easily allows the Forensic Technology Center of Excellence to capture complete analytical views of every grant in their pipeline. The Grant Management System (GMS) gives the FTCoE a level of measurable impact which empowers, captures expectations and helps with their efforts. This central source of data also allows the focused dissemination of information that ultimately assists the efforts of the forensic community.